Reprinted with permission. 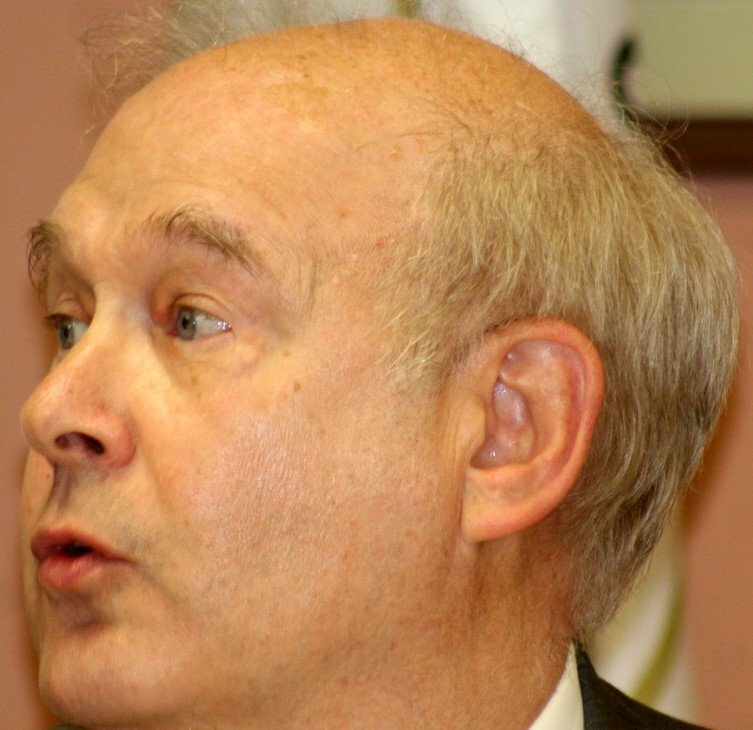 The Algonquin Township Attorney Jim Kelly has been paid for work not associated with the Algonquin Township Road District but was paid for the work by Bob Miller and the Road District. McHenry Co. (ECWd) –We have seen a lot of shady stuff in our time but I think this one may well make the bucket list as an all-time stupid move. 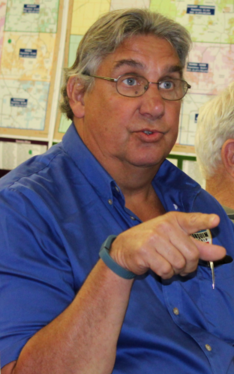 We exposed Bob Miller’s position as President of the Northern Illinois Township Highway Commissioners Association (NITHCA) in this article. That same article outlined that James Kelly’s law firm was the agent of record, as confirmed with this document. This article exposed billing for a PowerPoint presentation that was believed to be used for a meeting with the NITHCA. To date, no one can produce the presentation, even though Kelly charged for its drafting and preview. Bob Miller operated this private business from the Township Road District office. Bob Miller had membership dues being sent to the Township Road District office for this private business. James Kelly, Road District attorney at the time, his law firm was agent of record for this private business operating out of a public facility. James Kelly billed the Township Road District 5.5 hours for attending a meeting with highway Commissioners. About now the defenders are trying to justify why none of this is a big deal, all while ignoring the fact it is illegal for an elected official to run a private business out of his elected office and use public funds to pay for his private business attorney. James Kelly billed the Road District for legal servicesperformed for Miller’s private business, NITHCA. –“Prepare materials for NITHCA”. That billing was dated June 5, 2015. The articles of incorporation records reflect an incorporation date of June 17, 2015. It would appear, based on the timeline, Kelly may well have been preparing the corporate records for Miller. The problem comes with the fact he billed a public body for services that had nothing to do with Algonquin Township Road District Business. Submitting invoices to public bodies for services performed on behalf of a private business is neither legal or ethical. In fact, most would say it’s downright dishonest and probably a crime. How would you feel to get a legal bill for another business’s legal work? Bob Miller defending township government at a McHenry County Township Consolidation Task Force meeting. Miller didn’t seem to mind! Miller submitted the bill for payment even though he knew it was for his private business. Kelly knew as well that this was not a Road District bill as he specifically identified that it was for the private business. Never mind the fact he knew his firm was the agent of record for this private business. The bill was paid with taxpayer funds on June 6, 2015. This is an abuse of the taxpayer that cannot be ignored. Again, I am sure we still have people that are going to try to make excuses and insinuate that it was just an honest mistake. 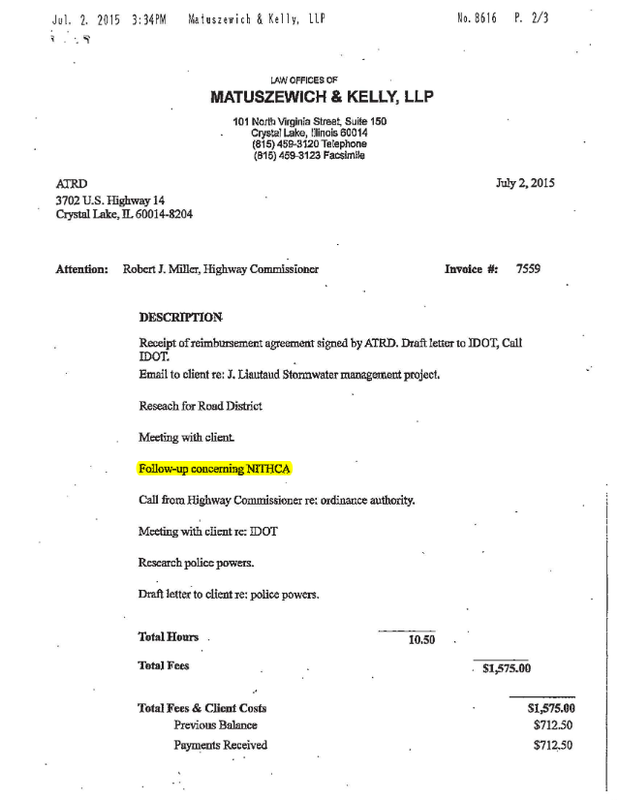 James Kelly billed the Road District again for Miller’s private business, NITHCA. –“Follow up concerning NITHCA”. This billing came the following month and it too was submitted by Bob Miller for payment from the taxpayer’s treasury. Miller knew this was not a Road District expenditure but rather an expense for legal work for his own business. The bill was paid with taxpayer funds on July 8, 2015. 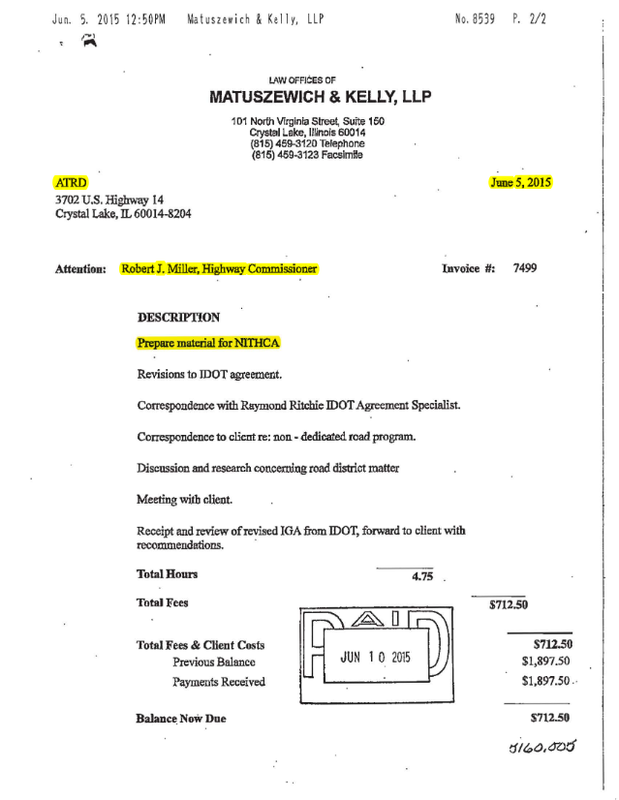 James Kelly knows this is not a proper expense for the Road District as it too clearly identified that it was for matters related to the private business of which his firm was the agent of record for NITHCA. Criminal Prosecution – Will require a State’s Attorney that operates on the offensive instead of searching for defenses. Civil Suit to recover false claims presented by the Attorney. ARDC Complaint – Billing one client for another clients work is unethical and violates the canons the attorney is bound by. Attend the Township meetings and demand this attorney be fired. We don’t believe the operation of a private business out of a public office and then charging the taxpayers for legal services for this private business is something that can be justified away. We believe Bob Miller must be held accountable for this outrageous violation of our laws. We also don’t believe an attorney can legally charge one client for the work performed on behalf of another client. In this case, the matter is even worse as the attorney knows such a bill should have never been charged to a public body. This is an abuse to the taxpayers that must not be ignored by the State’s Attorney as well as the ARDC. at the Taxpayer’s Expense . . . When are these people going to be brought to justice!???? Kelley is pretty smelly. He runs a divorce law office. I should know, he represented my wife years ago, and managed to screw up the case. She fired him for overbilling. Scamming individual clients is one thing, but pilfering taxpayer $$$ for years on the Miller no-work gangpile is outrageous. He really needs a forensic examination. a person, especially a lawyer, who uses unscrupulous, fraudulent, or deceptive methods in business.